Hollins, David. 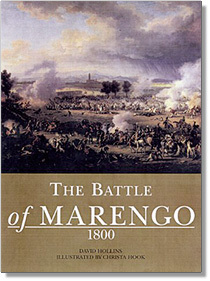 Marengo 1800: Napoleon's Day of Fate. ("Campaign Series," no. 70) Oxford, UK: Osprey, 2000. 122 pages. ISBN# 1855329654. $19.95. The 1800 Spring campaign secured Napoleon's grip on power, so that much of what has subsequently been written has been designed either to put Bonaparte in the best possible light or as a keystone of the whole glorification of the wars of the following 15 years. It is therefore important to bear those influences in mind and consider what really happened. However, this was the first stage of the analysis: an Osprey Campaign must be designed to appeal to a wide range of readers from the complete novice to the veteran enthusiast, who wants a quick reference. At 30,000 words, it is both necessary to generalise and impossible to put in aspects which readers would find in a full-scale hardback. Of course, it will not please the more ardent Bonapartists, but overall it has been well received, getting now to almost No. 30,000 in the Amazon.com chart, having also reached 1860 in the UK. I hope it will also act as a springboard for further study of the Revolutionary wars. It came as no surprise to find the NSF's most enthusiastic Napoleon fan having first go at it and much of Kevin Kiley's case has been dealt with in the strands on the History Forum. I will put my hand up to errors, but perhaps Kevin should do so too. Berthier, who was the commander of the Army of the Reserve, although I did say this was essentially nominal, was going to take the fall if the campaign went wrong and blame couldn't be heaped on Moreau and Massena. Widely regarded as the chief clerk of the army, he famously sends out the detailed versions of Napoleon's orders and gets in muddles in 1806 and 1809. To do the detailed work and sort out supplies, etc. in Napoleon's army as he did for the Reserve prior to 6th May fits my description. The story of how Napoleon acquired Berthier in 1796 is too complex and all I was illustrating was the nature of the relationship between the men. I am not sure that most readers would appreciate the difference between topography and geography. Dupont was the Chief of Staff and writes the relevant reports - that he is denigrated because of Baylen merely demonstrates how the story has been twisted to suit Napoleon's requirements. All the OBs give him this title and it was his job. Along with Monnier and Guenand, he is blotted out, while others like Victor have their parts downgraded to make Boney himself and his supporters shine through. The primary purpose of an Osprey is to introduce many people to the subject and not get bogged in technicalities - we can argue about the niceties of the meanings of deploying and open order, but it is of little use to anyone not overly familiar with the terminology. Dissolving into skirmishers is a commonly used expression to get such ideas across simply. Again, the refusal of the 72e to march has to be expressed in a way to reveal how it probably occurred. No one said, "We are not going," as they felt they couldn't do that, so it was a case of a lot of nonsense about not exposing the First Consul to danger. A polite refusal seemed to get the message over. This is of course the same 72e who get lionized in Foudras's piece of propaganda (there is no memoir or other evidence) - its impossibility through a fourth line was pointed out by Terry, who provided the French material and whose familiarity with the 1791 regulations is clearly greater than mine or Kevin's. John Cook has now shown that the British version was also a subsequent bit of myth making. It is simply a case of looking at events and the regulations to see what really happened. The mythology also affects the formation of the Reserve, many of those at Dijon taking no part in the main clashes at all. I don't understand the ambiguity of the Austrian attack and panicked flight over the Fontanone. Total casualties appear in the Austrian after-battle records, but there are no comprehensive or accurate French documents. It is a case of comparing strengths, looking at regimental histories and the like, but remember that French units had been under severe onslaught for most of the day before the tables were turned. The figure Kevin relies on was not based on contemporary records. Kellermann had done extremely well all day, but his final attack was in fact part of a tri-arms attack. He deserves much more credit - but Bonaparte refused to give it to him. The counterattack was organized by Desaix, who kept his nerve as Bonaparte thought only of securing a position to protect the casualty stations towards San Giuliano. Desaix asked Bonaparte for cavalry on the basis that it attacked the Austrian flank as he led the infantry charge. Bonaparte told Kellermann to get on with it and Kellermann timed his attack skilfully. Yes, if you want to write an essay on this, you can sort out the C3, but here the author has a few lines to express who really arranged all this. Bonaparte was only on the field for about 4 hours and didn't join the main advance - handily Desaix was dead by the time Bonaparte was setting about claiming the credit. Thus what we have here are a collection of criticisms, based on the mythology surrounding the actions and a fundamental failure to understand how and for whom an Osprey is written. Consequently, it follows quite naturally that Kevin should dwell on the Guard - well, sorry to disappoint Kevin, but there isn't a shred of evidence to support the square/block of granite. I wonder where in the 1791 regulations it says that a firefight with another infantry unit should be conducted in square? Any author must look at all the evidence, direct eyewitness and supporting, to reach a conclusion, but an Osprey is not the place for a detailed footnoting and analysis. However, some people just won't accept the material in front of them. That however is a problem for them and not a valid criticism of any book. Yes, I have featured it as it is a key part of the story and indeed, in the expectation that someone can counter it. Like Stutterheim, who did actually see the event, I am still waiting for contradictory evidence. "Reliable secondary sources" are of course merely a matter of opinion, not evidence - especially when that kind of material here is based on a man who can't have seen it (Coignet), a man who was looking at another unit (Petit) and a Bulletin. The recent authors Kevin quotes have all merely copied the received wisdom or in Rothenburg's case not addressed the matter. Having been looted of all my copies at the bicentennial event, I don't have a copy in front of me, but I seem to have made a mistake on p.51 putting in Molitor in place of Monnier. I know almost nothing about Molitor - however, the origin is one Major Molitor of 10th Lobkowitz Light Dragoons who engaged Monnier¹s men and the Guard. Oh well, just had too much source material, I suppose. I thought hard about the terms General and Lieutenant General, which are not ranks, but designate force commanders - a table was ruled out for space reasons and I think that it might prompt some readers to read up on it, which can be no bad thing. Kevin is in a minority of one thus far in disliking Christa's artwork. There is enough nonsense about the glories of war without adding to it. Plates can be used for a variety of purposes, above all here, that there are few b/w illustrations showing the Austrians at all. Okay, there are few errors and some generalisations, but these form no basis for the concluding allegation of Francophobia, which is like the "ism" allegations regularly thrown in debates these days. They are vague and unsubstantiated, but difficult to refute without writing an essay. Well, I am a big boy and I don't view criticism of my work as a personal attack, unless there are unfounded allegations about the origins of my information. Unable to substantiate his key point, the reviewer has resorted to such an unfounded generalisation simply because the booklet doesn¹t tow the Bonapartist line - and here lies the true basis of the review. Ultimately, I am responsible for the work, but it would have been impossible without Terry Crowdy and many others, who are obviously characterised as Francophile and would not wish to be associated with a work of the type Kevin claims. De Cugnac's work, French regimental histories and archival documents were checked by others, not me, and in dealing with a bibliography, you have to remember who you are writing for - it didn't help that the publishers removed the reference to the longer hardback. The Osprey is designed for the more general enthusiast; detailed argument of the type Kevin talks about will have to await the longer version.